To increase the productivity of its customers through self-learning machines, Festo employs artificial intelligence on the edge, on premises and in the cloud. In addition to the complex services that can be offered in a cloud, Festo sees great potential in simple real-time data analysis by means of AI – either directly on the field component (AI on edge) or in the control of either the system or a production plant (AI on premises). The plant operator retains full control of his or her machine data, which do not need to be transmitted to a cloud via the Internet. Festo has further extended its AI competence with the acquisition of Resolto Informatik GmbH in 2018. With SCRAITEC, Resolto has developed a software solution that analyses and interprets data in real time and recognises and reports anomalies. The system also constantly learns by means of permanent data analysis and expands its knowledge base. This machine learning makes intelligent process monitoring possible. 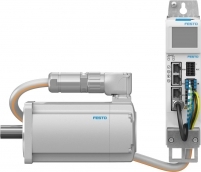 The acquisition and monitoring of data by the intelligent software solution can be carried out either on edge or on premises, or via the IoT gateway CPX-IOT in the Festo Cloud. The use of AI on edge or on premises ensures that all data remain in-house, without security risks or delays in data streams due to network latency. On the other hand, the cloud with its very high computing capacities provides superior evaluation results spread over several distributed production locations. AI greatly reduces the programming effort for process monitoring and error management, and the customer is provided with valuable know-how in real time. Faulty parts and processes, or machine failure, can be detected and prevented at an early stage in the production process. A further advantage is the complete transparency and traceability of process anomalies to a specific manufactured part. Large-scale product recalls affecting entire production series could be avoided in future, since a faulty part can be precisely identified and removed from the batch.